Buying a powerful, low-slung two-seat “sports car” specifically to sit in traffic seems a little odd. Or is it actually an excellent idea? Consider the ’90s Mercedes SL. Despite its name standing for “Sport Leicht” the car doesn’t feel particularly sporty today and with a curb weight over 4,000 pounds, it was never legitimately light. That’s because the R129, as this era SL is also known, was never really meant to be a sports car at all. It was (and is) actually what some people refer to as a “Personal Luxury Coupe.” Or a grand touring car. Not “slow” per se, but built more for gentle adventures than attacking backroads. See also: BMW 8-Series, Jaguar XJS, Cadillac ETC (they’ll get cool at some point, I’m still hoping) and other proportionally-similar flying armchairs. Matt Farah, one of the wealthy car guy YouTubers so many of us like to live vicariously through, recently had the epiphany that cars like this are not only great for road trips, but they’re also excellent antidotes to city traffic. As much fun as a Ford Focus RS or heavily-modified Mustang can be in the canyons (both of which Farah also owns) an elegant fake sports car like the SL with (gasp) an automatic transmission, can actually be pretty excellent for getting around town. Farah’s message resonates with me because, while I can’t say I’m sick of shifting in LA yet, I do love Mercedes V8s and this era of SL in particular. Good gracious, that design really has aged well. Like the original W202 C-Class from around the same era, which I also love, the R129’s look isn’t fresh but after all these years it still seems stately. 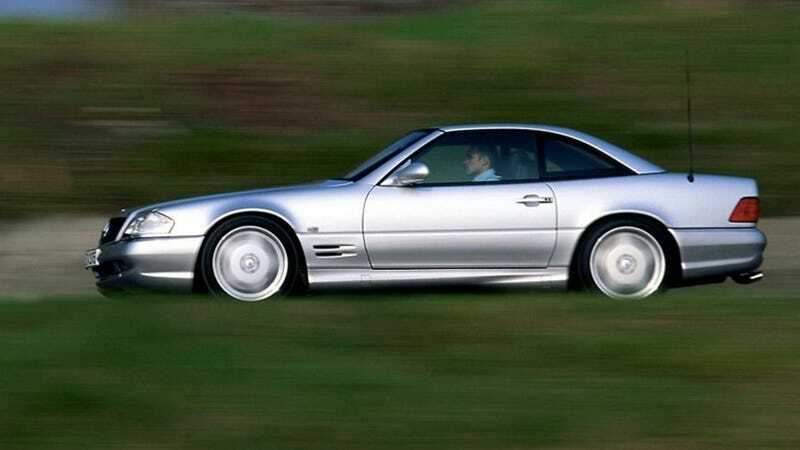 Of course the 1990 SL’s 300-odd horsepower output claim would have seemed a lot more impressive back in the car’s day. When it was new, the R129 SL had a little more legitimacy to the “Sport” in its name. But even if it’d get dusted by a modern economy car, I think classy cruisers like this Benz will start to seem more appealing as people realize a lot of their driving actually takes place at a gridlock pace. And unlike a hot hatch, these things are enjoyable at any speed.